© 2006 Corporate Connecticut. Reprinted with permission. Horseshoe crabs aren’t bugs. They aren't really crabs, either. The prehistoric-looking creatures known properly as Limulus polyphemus are more closely related to spiders and scorpions than true crabs. The innocuous sea creatures are living fossils and have been scuttling about quietly pretty much unchanged for some 250 million years. So who cares? As a primate who can think, you should. The primitive immune system of the horseshoe crab makes them medically quite useful to humans. Every drug certified by the FDA must be tested using the horseshoe crab derivative known as Limulus Amebocyte Lysate (LAL). The LAL extract made from horseshoe crab blood (which is bright blue, by the way), is used to test drugs and vaccine for possible bacterial contamination. Horseshoe crab blood is worth an estimated $15,000 a quart, according to the Mid-Atlantic Sea Grant Programs/National Oceanic and Atmospheric Administration Web site (www.ocean.udel.edu). Researchers have also found substances in the crabs that have potential as antibiotics as well as anti-viral and anti-cancer agents. Try to put a price on that untapped potential. Whenever you get a vaccine, the crab’s life is linked to yours as a benefit from medical testing. That’s very good, because bad bacteria can be lethal. Gram-negative bacteria can be nasty stuff that cause life-threatening diseases like meningitis, typhoid, cholera, and toxic shock syndrome. Escherichia coli is benign in its proper environment; taken out of those rich corridors of gut and bowel, e.coli can cause serious illness. Marine scientist William Sargent wrote a very readable book, Crab Wars: A Tale of Horseshoe Crabs, Bioterrorism and Human Health. One horseshoe crab can be bled, returned to the ocean, and after time, can give blood again. Or so it’s supposed to go. Tapping the horseshoe crab market has spawned a multi-million dollar biomedical business. Researchers are exploring the potential to culture cells that produce LAL. This development could potentially eliminate the need to catch the horseshoe crabs by the biomedical industry. The ASMFC is composed of 15 Atlantic coast states: Maine, New Hampshire, Massachusetts, Rhode Island, Connecticut, New York, New Jersey, Pennsylvania, Delaware, Maryland, Virginia, North Carolina, South Carolina, Georgia, and Florida. In 2003 Congress allocated $630,000 for horseshoe crab research funding to Virginia Tech's Horseshoe Crab Research Center (HCRC) in Blacksburg, Virginia. 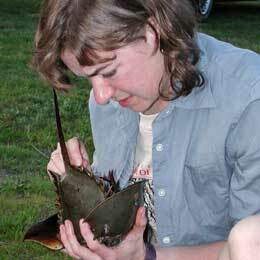 Virginia Tech's HCRC is the largest horseshoe crab research institution in the country. India and China are working on cloning toxin-detecting genes in horseshoe crab blood so that LAL derivatives could be made without the harvest of horseshoe crabs. United States biomedical companies include Associates of Cape Cod, www.acciusa.com; Cambrex, www.cambrex.com/default.asp; and Charles River Endosafe, www.criver.com. There are those who view the shelled creatures as bait or a nuisance; others see the lumbering critters as potential biters (they are harmless) and still others see the big picture. Horseshoe crabs are a natural wonder many take for granted. Not so for migratory shorebirds that depend on horseshoe crab eggs to help fuel their own journeys to breeding grounds. The spiky tail is used by the crab to flip itself over when it’s washed upside down by waves or travel. Regionally, nature centers offer canoe and kayak outings to view the mass migration of the shelled sea creatures in late spring/early summer, providing a tourism/recreation aspect to the horseshoe crab population. With life cycles tied to lunar cycles, the crabs come ashore to mate and return to the sea in many locations on the eastern Atlantic coast of the United States. Inside Mystic Aquarium, the critters are on display for in-house education. Others travel with science educators for outreach programs within a 75-mile radius. So are there enough horseshoe crabs out there to continue to inspire curiosity from beach-goers on the Atlantic coast as well as answer the need for biomedical purposes? Money makes people do strange things. One last detail. Why the reference to a horseshoe for its name? Well, the animal was originally dubbed “horsefoot” due to its resemblance to a horse’s hoof. Ecological Research and Development Group, 32239 Nassau Road, Lewes, DE 19958; (302) 644-8129. Visit www.horseshoecrab.org/med/med.html (Medical Uses). Atlantic States Marine Fisheries Commission, 1444 Eye St., NW, 6th Floor, Washington, D.C. 20005; (202) 289-6400. In Connecticut, Eric Smith, CT DEP, Marine Fisheries, 333 Ferry Rd., P.O. Box 719, Old Lyme, CT 06371; (860) 434-6043. Dr. Lance Stewart, University of Connecticut CANR/CES, Avery Point, 1084 Shennecossett Rd., Groton, CT 06340; (860) 887-1608. Crab Wars: A Tale of Horseshoe Crabs, Bioterrorism, And Human Health by William Sargent. Published by University Press of New England. A touch tank with lobsters, horseshoe and hermit crabs, barnacles, and oysters is located at the Bruce Museum Seaside Center, located on Greenwich Point. The center aim is to educate visitors about the ecology of Long Island Sound and environmental issues. There is no admission fee, but visitors need a beach pass to enter Greenwich Point. For information about the Bruce Museum, located at One Museum Dr., Greenwich, call (203) 869-0376. For more about field trips, visit Denison Pequotsepos Nature Center in Mystic, 109 Pequotsepos Rd. Or call (860) 536-1216;e-mail is info@dpnc.org. The touch tank at Norwalk’s Maritime Aquarium includes horseshoe crabs. Call ahead (203) 852-0700 to confirm. Web site www.maritimeaquarium.org; admission. Located at 10 North Water St., Norwalk. For information about the Virginia Tech Horseshoe Crab Research Center visit www.nmfs.vt.edu, or contact Dr. Jim Berkson, director, at (540) 231-5910; jberkson@vt.edu. "Limulus is a true "blue blood" for, while human blood is red, the blood of this creature is a light blue. Human blood is red because it has a red pigment called hemoglobin which contains iron. The Limulus blood contains copper rather than hemoglobin thus giving the blood its blue color. The animal's blood also contains fantastically sensitive chemicals used by researchers in discovering harmful bacteria called endotoxins, sometimes found in human blood. In short, the blood of this ancient animal might well save your life some day." - From Rhode Island’s Sea Grant web site. Visit www.seagrant.gso.uri.edu/factsheets/horseshoe_crab.html.